I've had One of Us is Lying by Karen McManus on my reading list for a while now, but never seemed to have the time to read it. I was determined to read it this fall, as it seriously sounded like the perfect murder mystery novel! I'm really glad that I added it to my Fall TBR, as it was a great read to kick off October! I really enjoyed the murder mystery storyline of the book. I've been reading a lot of them lately, as they are the perfect books to read around Halloween time, and this one was great. It was a little predictable in some areas, though that's probably because I've read a lot mysteries lately, (AND because I'm pretty much naturally suspicious of everything), but there were a few twists that kept me guessing as well. It was also a really quick read! Whenever I sat down with the book, I flew through the pages. SO good. 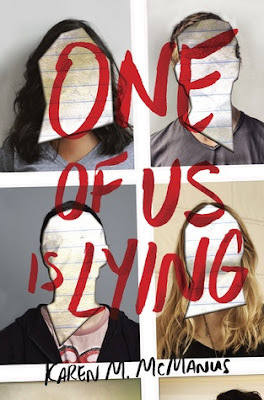 Overall; I enjoyed reading One of Us is Lying, even more than I actually expected to. I will definitely be keeping my eye out for more books by Karen in the future, as I will definitely want to check out whatever she comes up with next!